Here’s one more Easter treat for you! As much as hot cross buns will always be my first choice for Easter treats, I know that not everybody has the time, or the desire, to spend half a day making them (though I do urge you to try them as they are incredible!). 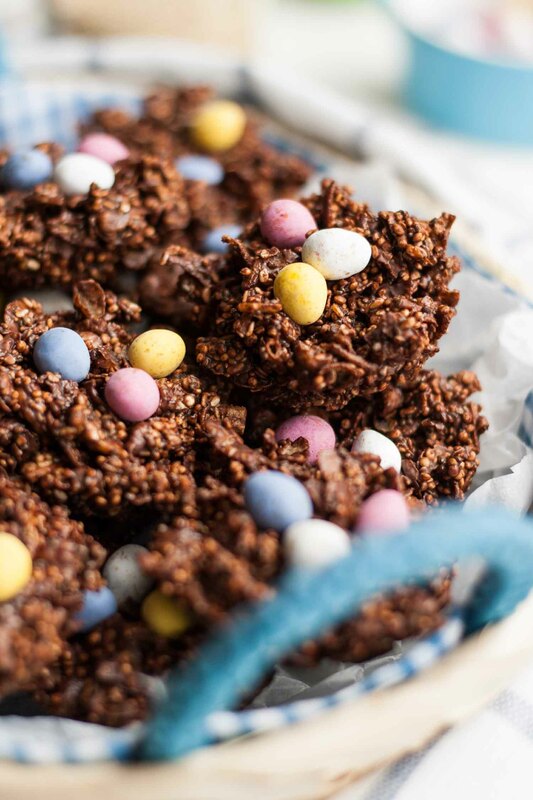 So with that in mind, I made these Super-Seeded Easter Nests as an alternative – not that it’s necessarily a case of one or the other, I must add! These treats are quick-to-make, super tasty and kid-friendly, with the added bonus of being stuffed full of nutritious seeds. I’m certainly not making a claim that these are healthy – they are made with lots of regular chocolate after all – but I do enjoy a smug feeling knowing that my sweet snack is packed with quinoa and chia seeds. Balance! I love Easter. I think for me that it’s the joy of the season: the beginning of spring, the fresh and vibrant colours after a grey winter, the arrival of new life… Speaking of new life, we went to visit my brother and his partner at the weekend to meet our baby nephew! 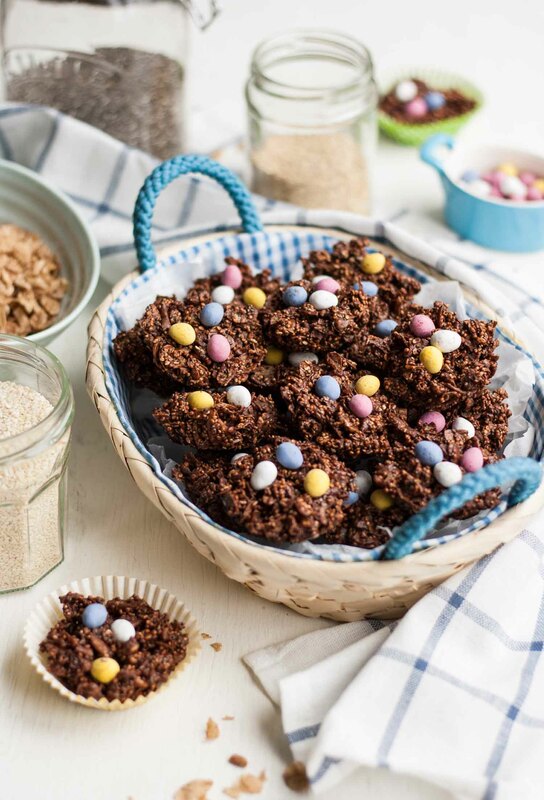 So these Super-Seeded Easter Nests! 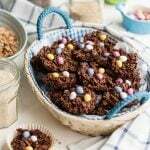 Traditionally, Easter nests are made of either cornflakes or shredded wheat, bound with a mixture of melted chocolate and golden syrup. I wanted my version to be more texturally exciting, with the crunchy elements being wholesome and nutritious. I also wanted to omit the golden syrup. The only potentially ‘difficult’ aspect of this recipe is the toasting of the quinoa but it’s actually not difficult at all. This extra step is well worth the 10 minutes it takes to complete, resulting in addictively crunchy and nutty quinoa which adds another dimension to these simple treats. Added to the quinoa we have: chia seeds, sesame seeds (basically any seeds you like! 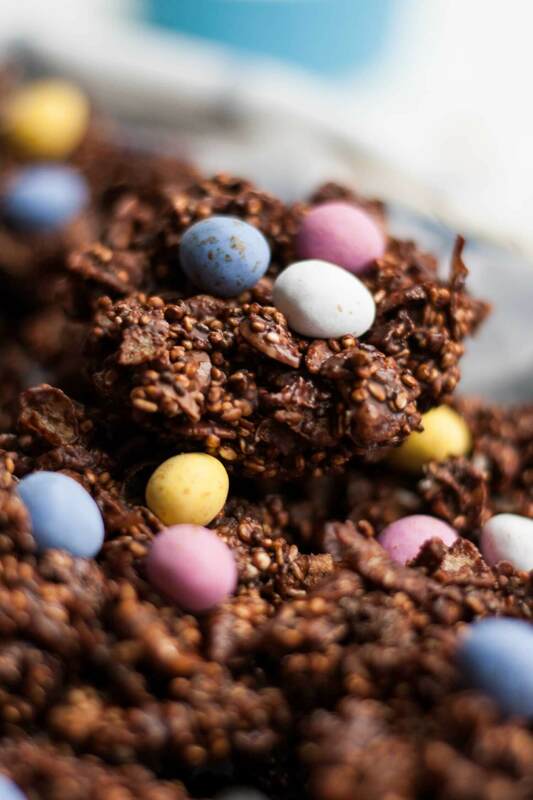 ), flaked almonds and spelt flakes all tossed together with some melted chocolate and topped with cute little chocolate eggs. What could be simpler? 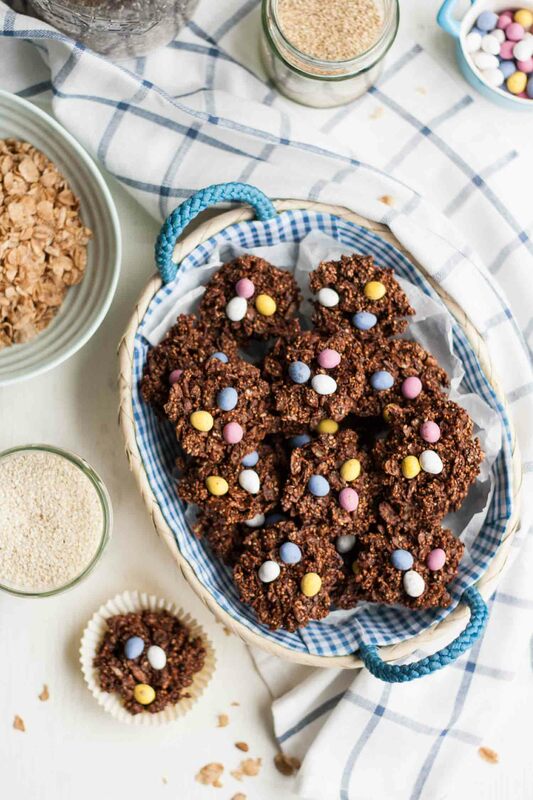 I’ve suggested spelt flakes as the cereal element for these little nests, but walk into any health food store and you’ll be greeted with any array of exciting cereals to try. From spelt flakes and quinoa puffs, to amaranth pops, buckwheat and millet puffs and many more. You could get as creative as you like here! My only stipulation would be to look for something that’s sugar-free, but of course that’s entirely up to you. Tell me, what will you be eating for Easter brunch/lunch/dinner this year?! Give me some inspiration! 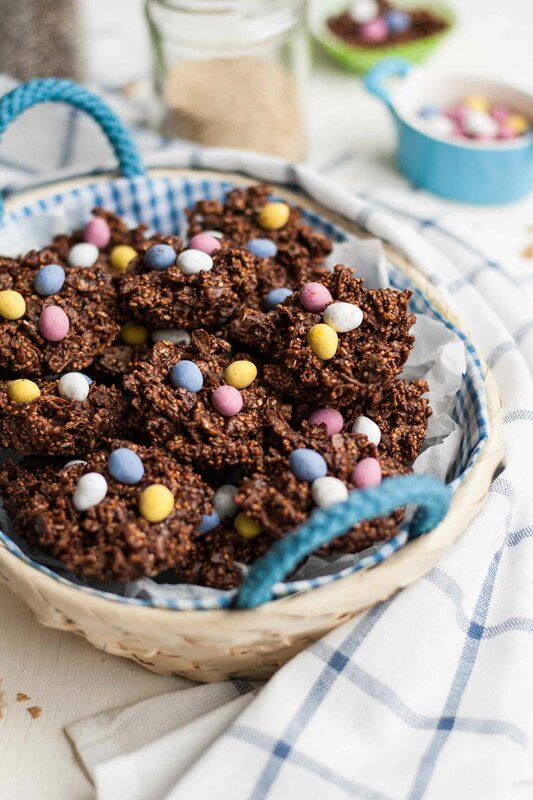 I do hope you’ll give these yummy crispy nests a go for a simple sweet treat! 7 ounces chocolate (200 g) I used mostly dark with a little milk, but you can use all dark or all milk if you prefer! Place the rinsed and drained quinoa into a frying pan over medium heat. Heat until the water has evaporated and the grains begin to pop, stirring frequently. The quinoa is ready when it has turned golden and smells nutty and fragrant, this should take around 5 minutes. Remove to a large bowl to cool. Add the flaked almonds, sesame seeds, chia seeds, spelt flakes and a pinch of salt to the toasted and cooled quinoa. Place the chocolate into a small heatproof bowl. Set the bowl on a pan of barely simmering water, ensuring the water doesn't touch the bowl. Stir occasionally until melted. 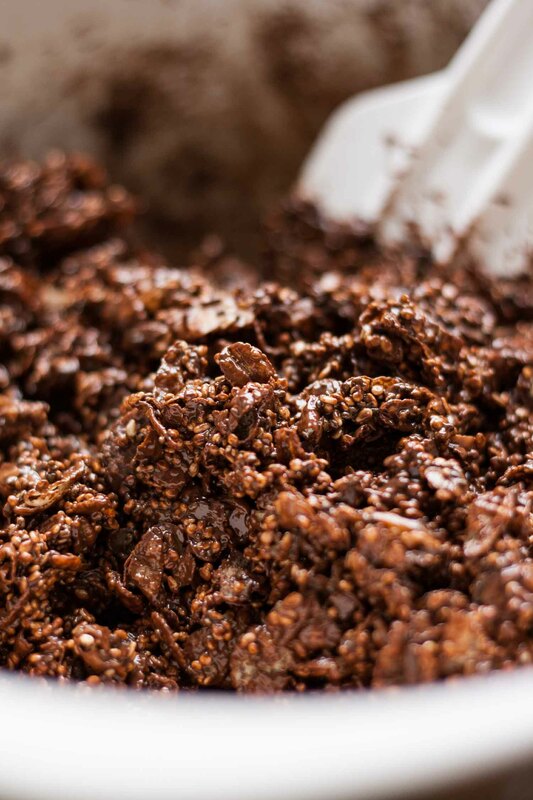 Pour the chocolate over the dry ingredients and mix well until fully incorporated. Press the mixture into the holes of a greased muffin tin or a baking sheet lined with paper cases. Top each nest with a few chocolate eggs and leave in a cool place to set - they should be ready in around 20 minutes. Feel free to vary the seeds/cereals as you see fit! 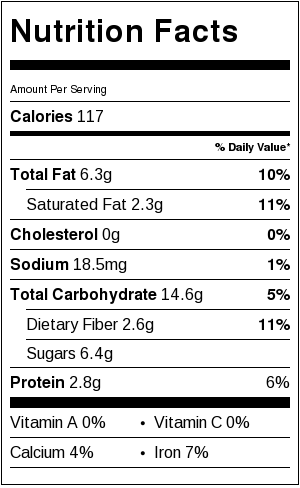 Nutrition label is for one nest out of a total of 18, excluding the chocolate eggs. Congratulations on the baby nephew! These look amazing and tasty, love how you used quinoa in the recipe… Great share!